REDDING, Calif.—When she graduated from college on April 27, 22-year-old Tempest Dawson had a lot of eyes on her. The oldest of 10 siblings, she’s got quite a standard to uphold. It’s a role the Simpson University biology major has taken to heart. She transferred to Simpson three years ago from junior college in Stockton, recruited by a basketball coach on a scouting trip. 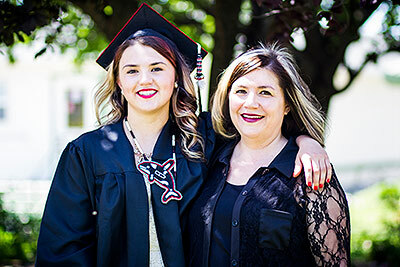 Tempest grew up in Chiloquin, Ore., on the Klamath Indian tribe’s reservation. A direct descendant of the Klamath tribe, she’s also enrolled in the Tulalip tribe. Her American Indian family and surroundings helped shape her character and her passion for service. As a girl, Tempest would sometimes go to college with her mother, who is pursuing her doctorate in psychology. Having that kind of role model fueled Tempest’s own aspirations. “I’ve wanted to be a doctor ever since I was really young,” she said. She chose to major in biology at Simpson to help meet the requirements for medical school. Her psychology minor also reflects her mother’s impact—and rounds out Tempest’s holistic approach to medicine. In addition to playing basketball, Tempest also was vice president of the campus Biology Club for two years and a member for three. In spring 2011, she traveled to Guatemala on a medical missions trip, helping with patient intake at a nonprofit clinic. But as time went on, she began to appreciate the rigor. A biology major takes courses that include microbiology, biochemistry, physics, chemistry, genetics, immunology—almost all of which require hours in the lab each week. The university has about 40 biology majors, two of whom graduated this spring. Tempest found the small class sizes—sometimes three to seven students—to be helpful. Simpson’s service mindset also enhanced Tempest’s academic experience. She volunteered at Mercy Medical Center in Redding as part of the ministry practicum all Simpson students participate in for two semesters. “It helped validate that I really want to be a doctor,” she said. Tempest’s dream is to be a family practitioner in a rural Indian area. “I want to give back to my community,” she said. She notes that her ethnic background and cultural understanding could eliminate some barriers in providing care to patients who might not be as comfortable elsewhere. Her practical, giving spirit is already known in her community. For the past two summers, she and her mother have organized a grant-funded youth basketball program for the American Indian children around the Klamath reservation area. Tempest leads the camps, often hiring other college ball players to help out. She also worked in the Klamath Tribal Wellness Center, securing her EMT license in the process. During part of her time at Simpson, she went home one weekend a month to volunteer on the Chiloquin ambulance. Her drive and work ethic also helped her secure funding for college. Tempest researched medical school requirements and began applying for scholarships to help her achieve that goal. Prior to her final year at Simpson, she applied for an MCAT preparation program through the University of North Dakota and was awarded a scholarship to study for the MCAT. She also earned a scholarship for a 14-day EMT boot camp. The biology professors at Simpson said they were impressed by Tempest’s behind-the-scenes work to pursue her education.